As I have bone metastases, ‘bone pain’ was the first symptom I had that showed I was in trouble. Symptoms were a leg that felt strained at the top, and made we walk like a table, and REALLY bad back ache. I’ve now finished chemo and radio therapies, but ongoing (till it ‘stops working’ – don’t like the sound of that) I’m having monthly infusions of bisphosphonate. I don’t quite understand how it works – it stops my clasts blasting* or something – but the results are fantastic. The positive effect seems to have built a little with each infusion, and this week I’m delighted to announce that I feel ‘normal’, except that my ‘normal’ is better than it used to be because I’m 70lbs lighter. On Monday I walked 7 miles, and helped to water the allotment, which is a back breaking task even for a healthy individual. Tuesday it was just a 3 mile walk, with more watering. It’s hard to remember I could barely walk across the room a year ago, and couldn’t even put on my own pants. I used to try to don my pants with a walking stick, but it always ended in hopeless twiddling, like one of those plates on sticks stunts beloved by circuses. I just wanted to put a little positive note up here, because so many of us write about gruelling treatments etc, but rarely write about their effects, and how sometimes they actually work! It’s nearly 6 months since I finished chemo. Yesterday I felt that I’m back. I’ve arrived. This is it. My energy levels are back to normal. In fact, better than that because I’m 70lbs lighter than what I remember as ‘normal’, pre-diagnosis. I got up at 6.00am, made the daughter’s packed lunch, did two loads of washing, got the dehydrator whizzing along with two sorts of crackers, made bread. Then, ‘speed-walked’ with the dog 4 miles round Berry Head. (I don’t mean to speed-walk – it’s just that I can’t control the dog.) Popped into the allotment and picked herbs for dinner. After a cup of tea (green, natch) I prepared a stupidly complicated dinner which required 2 hours of standing in the kitchen. A year ago I couldn’t even stand up for 10 minutes, and needed painkillers every 4 hours. I ironed the linen and made the bed. I washed up, and FINALLY sat down in my super sleepy old person’s motorised chair at 8.00pm, and DIDN’T doze off! Amazing! I had a slight backache off and on during the day, but that’s going to be ongoing because the cancer is in my spine and has caused ‘instability’, but nothing worth worrying about. In fact, I haven’t taken a single painkiller in 2013. Isn’t that wonderful? Well, must dash. I’ve got to have a juice (carrot, apple and ginger) before I dash off to the spa for a swim and a sauna, then dog-walking around the beautiful Devon Coast this afternoon. Life couldn’t be sweeter! Back home after second chemo. Apart from difficulty getting the line in (as ever!) it went very well. I’m feeling good. Went to the pub (only sparkly water for me) and cooked dinner when I got back home – lamb meatballs, cabbage and guacamole in soft wheaten wraps – my take on a doner kebab! Tasted good. I’m drinking loads of water, as per instructions, and hope it’s better this time. After my first chemo I was funneling fluid down the top end, and nothing was coming out. I put on 11lbs overnight! My eyes watered a bit, but they weren’t up to the task of shifting 3 litres of water, so I had to wait a few days for it to settle down. I hardly dare say that I do feel well. I feel like I’m tempting fate, and will wake up the morning with a nausea and sickness to end all puking bouts. So, I’ll just whisper it, I feel OK.
I’ve been quiet lately because I’ve been coming to terms with the fact that I have to create a whole new category on my blog called ‘Cancer’. 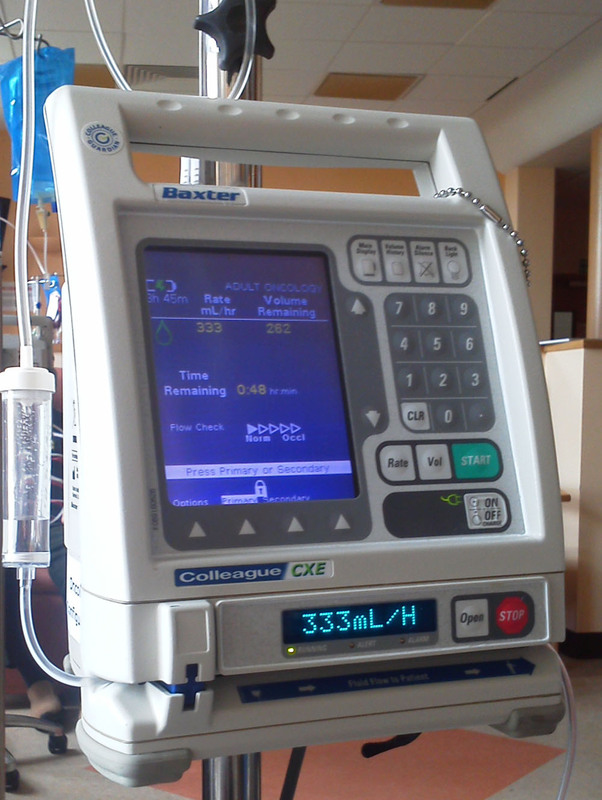 This is my new friend – a chemotherapy pump – and I have a date with it every three weeks for the next six months. I had a skirmish with breast cancer 10 years ago, and had a bilateral mastectomy and my ovaries removed. I didn’t need any further treatment, so went on my merry way, hoping to get old enough to experiment with the heart disease/circulatory issues that made up the other side of my gene bank. They told me that my treatment had reduced my likelihood of breast cancer returning to 2%. Unfortunately, I don’t think I realised that that was just it returning to the site of my breasts. It wouldn’t stop all the breast cancer associated secondary cancers – bone, liver etc. – cropping up unannounced. That has now happened. Anyway, I’m going to fight this thing. I can’t hope for a cure, but I am hoping I can extend my life and make it as happy and meaningful as possible. I’m grabbing all the conventional therapies with both hands, and also piling on anything else that looks helpful (bring on the new age whale music). Of course, there will be many recipes! In my attempt to increase my ‘5 a day’ towards ’10 a day’, I’ve already developed the 3 fruit breakfast fit for a vegan king! I’ll put it up soon.